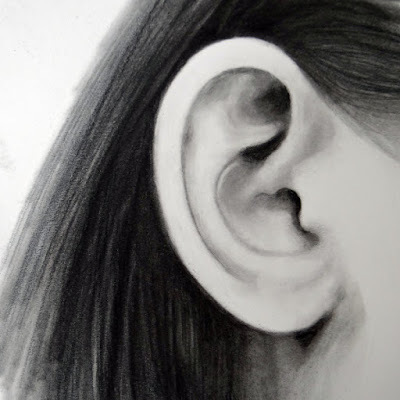 diana lynn's painting a day: Ear Ye! Ear Ye! Like a landscape of hills and valleys, that's the ear. I tried using graphite powder as a fill in for medium values on this drawing and it was a good thing. Not using color is both, confining and freeing but it teaches me a lot about the value of good values. The value of the ear? The older I get the more I realize how useless they can be. Huh? What'd you say?